Layla Grace and I strolled into the hospital for our weekly Therapy Dog shift and found ourselves face to face with Hospital Security. Freshly bathed, Layla sailed right through the stop sign on her way to the elevators while I was detained. I found myself being checked out by a cute security guard. After spending a moment hoping that my mascara was not smeared, I realized that I was being screened for flu symptoms (i.e. fever, runny nose--nice). The hospital had changed its visitation policy to protect the patients and staff against the flu. The guard let me go with a "hey, ....nice dog". We continued on our way dispensing dog love to patients and their families. We started in the waiting rooms. After a while, I realized that a large number of people were kissing Layla's face. I did not want Layla to transmit the flu via her cute but saliva drenched face so we ended up a bathroom where the poor dog didn't know what she had done to deserve another bath. To all of our Sweet Dog readers, remember to take care of yourself this flu season. The flu is transmitted by coughs, sneezes, and by handling objects that are contaminated with the virus and then touching your nose, eyes or mouth. Before the holiday craziness starts I also am prescribing a little dog love for all of you. Spend a little time getting rest, snuggling up with your pup, keeping warm and taking care of yourself. 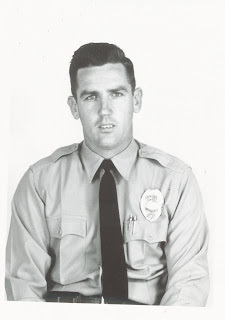 FYI: The picture (above) is my dad on his first day of work as a San Diego Police Officer. We all miss him like crazy.